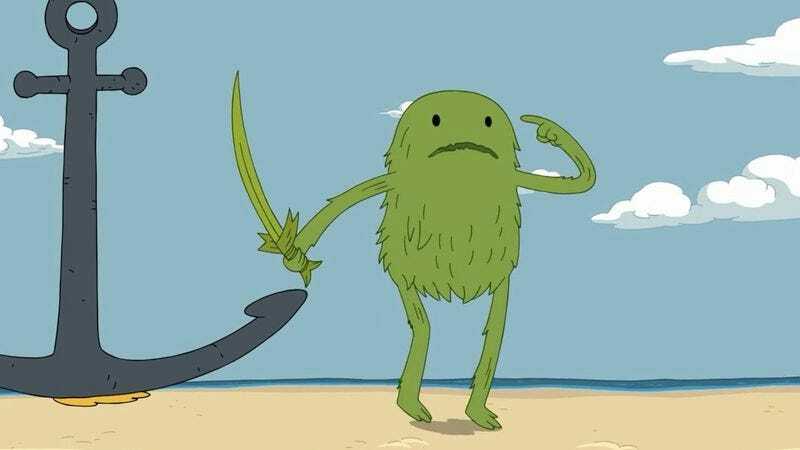 In the wake of Adventure Time’s season 7 finale, Finn has lost his right arm (again) and his Grass Sword and Finn Sword have merged to form a mysterious humanoid creature. “Two Swords” begins with Finn getting the bionic arm that has long been teased by this series, and as Finn rests in his hospital bed, he gives Princess Bubblegum the rundown on these strange recent events. This is a fairly straightforward episode introducing a bizarre new character to the series, and Grass Finn finds himself in the midst of an identity crisis when he realizes that he’s a warped copy of who he believes himself to be. Given that he’s the focal point of this two-part season premiere, it’s safe to assume that Grass Finn will play a considerable role in season 8, but the nature of that role is yet to be determined. At first glance, he appears to be a kind, gentle soul, inheriting Finn’s impulse to do good and help others, but there’s a darkness at the core of Grass Finn. A flashback to his birth reveals that the Finn inside the Finn Sword was transformed after encountering a small green grass-octopus-spider that describes itself as a “curse” and “an emissary from beyond,” two things that, taken together, suggest that the creature isn’t there to do anything positive. The visuals also reinforce the being’s malevolent foundation, and the combination of deep shadows plus a sickly green immediately indicates that there’s something very shifty going on inside the Finn Sword. Grass Finn remembers his birth when he sees his reflection inside a plate, and he’s deeply shaken by confirmation that he’s not the true Finn. It’s one thing for someone to tell him that his assumed identity is false, but it’s an entirely different thing for him to realize it himself. He has a complete breakdown with this discovery, breaking BMO’s china and Margaret’s records and spraying breakfast syrup all over the apartment. Grass Finn basically starts acting like a child having a temper tantrum, which is appropriate given that he’s not even a day old. When Jake tries to confront him, Grass Finn just turns away so that Jake is talking to the back of his head, which is a very basic angry child move. Now that Grass Finn knows that the memories in his head aren’t his, where does he go from here? He has to start anew, and it’s not surprising that he embraces infantile behavior as he’s forced into a confusing new situation. While Grass Finn’s existence is thrown into turmoil, the real Finn finds himself in a surprisingly zen place given all the craziness around him. He’s totally cool with losing his arm again, and having a bionic arm feels right. Long-time viewers of Adventure Time know that Finn’s bionic arm has been coming for a long time, and Finn is also feeling that sense of inevitability. This is the path Finn has always been on, and he feels comfort rather than trauma. It’s possible that Finn is in denial (we’ve seen that before), but given his behavior in the rest of the episode, it’s more likely that Finn has let himself be swept up by the winds of fate and is content to see where they take him. Lose your arm? No big deal. Meet your grass doppelganger? Sounds cool. Jake and BMO panic when Grass Finn trashes the tree house, but Finn realizes that fear and anger aren’t going to fix this problem. Instead, he chooses generosity and compassion, offering Grass Finn a Finncake that lets him know that he’s a welcome guest in their home. The scent of the sweet cupcake travels through Grass Finn’s sinuses and makes a tiny flower bloom inside his nasal cavity, a very effective visual representation of the delight Grass Finn experiences in this moment. I’m excited to see how Grass Finn’s storyline plays out over the course of this season, and I predict that there will be some major conflict between Grass Finn’s potentially villainous core and the hero he wants to be thanks to Finn’s example. Can someone become good if they’re born to be bad? This isn’t necessarily a new theme in Adventure Time, but it’s one that I always like to see more of because it speaks to preconceived notions of identity and morality. 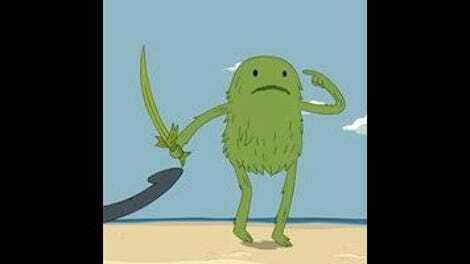 What is Grass Finn’s destiny? Is he simply a pawn of cosmic evil, or can he grow to become something better? Grass Finn directly tackles these questions in “Do No Harm,” which has him teaming up with Jake to do regular Finn stuff. He can’t eat because he has no digestive system and can’t play the flute because he can’t breathe, but he can fight evil, and he already has a target in mind. Jake and Finn travel to a verdant labyrinth that leads them to the wizard that created the Grass Sword, and when Grass Finn comes face-to-face with his creator, he unleashes a barrage of questions about his identity. Why was he made? Is he bad? Is he part of a conspiracy hatched by Finn’s enemies? Is he an eternal curse? Grass Finn is desperate for answers, and when he doesn’t get them, he reacts with anger and violence. He’s growing up fast, and while he acts like a child in “Two Swords,” his behavior is more reminiscent of an aggressive teenager in “Do No Harm.” He lashes out at his creator the way an adolescent might lash out at his parents, although that aggression is heightened in that typical Adventure Time fantasy way, manifesting as smacking the wizard around with a giant thorny arm. Jake stops Grass Finn before he goes too far, and the entire experience forces Grass Finn to realize that he’s definitely not Finn. The final scene has Grass Finn shedding Finn’s identity for good and taking on a new name, Fern, and it’s a major moment of self-discovery that sets him on a completely different path. Will that path lead to good or evil? We’ll have to wait to find out. The real Finn continues to be very chill about recent events in “Do No Harm,” but there is one thing that is causing him distress: his role in Susan Strong’s current comatose condition. He’s feeling down because he’s holding on to a lot of guilt, and in order to expel these feelings he heads to the Candy Hospital to offer care to his friend. His arrival is just what the overworked Doctor Princess needs, and she decides to ditch her duties and make Finn the chief practitioner for the rest of the shift. As I already mentioned, Finn has a natural instinct for helping people, but the obvious solution isn’t always the best one in the medical field. There are some great comedic moments in this storyline, and while Finn’s cures ultimately prove detrimental to his patients, his strategy for waking Susan from her coma actually would have worked if Doctor Princess hadn’t interfered. “Do No Harm” is a more complicated episode than “Two Swords,” and it’s an excellent Adventure Time debut for Laura Knetzger, who joins Emily Partridge as writer and storyboard artist. There are some beautifully atmospheric shots in this episode—I particularly love the pink skies at the beginning and end—and the environments are overflowing with small details that beg the viewer to pause the TV and take a closer look. The dissolve transitions from Finn to Fern reinforce the spiritual connection between the two characters, so when Fern rides off at the end of the episode, there’s a surprising sadness that emerges. These two episodes rapidly establish a sense of brotherhood between Finn and Fern, and while Fern definitely needs some time alone to discover who he is, hopefully he won’t spend too much time away from his new family. Want to learn more about all the human stuff teased in last season’s final episodes? Make sure you check out next week’s Adventure Time: Islands miniseries, which answers a lot of huge questions that have been lingering for this entire series. We won’t be doing episodic reviews for the miniseries, but you can find a general, spoiler-free TV review next Monday. Toast does not make a sturdy bridge. I recommend something along the lines of a peanut brittle or toffee. Nurse Poundcake has a crush on Jake. Casual aside or set-up for an upcoming episode about her infatuation? I understand that the residents of the tree house have been pretty busy recently, but they should really take out the trash sometime soon. Without spoiling anything, I will say that Finn’s storyline in “Do No Harm” ties in very nicely with Islands. Make of that what you will. Jake’s meatloaf looks super delicious. Anyone get a chance to check out the Adventure Time cookbook released last year? I still need to get my hands on it. “Weird days man, give me a minute to catch up.” This is a pretty accurate description of the last few months.